And while we’re on the topic of ICE, let it be known that they are not your average ensemble. With a modular makeup of 35 leading instrumentalists, the group performs contemporary classical music in forces ranging from solos to large ensembles. In fact, they make it their mission to advance the music of the 21th century by pioneering new musical works and multimedia strategies for audience engagement. In 2011 they created ICElab, an innovative new musical project which places teams of ICE musicians in collaboration with emerging composers to develop works that push the boundaries of the classical genre. 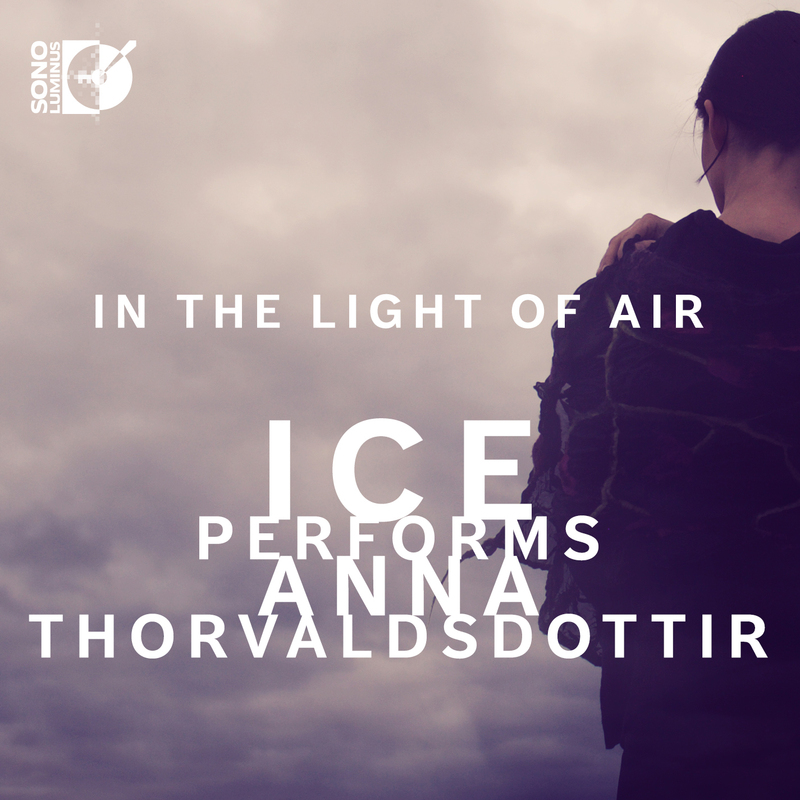 ICE’s latest album, titled “In the Light of Air: ICE Performs Anna Thorvaldsdottir,” is just a single product of that collaborative project. The album features two gorgeously enigmatic pieces: “In the Light of Air” for viola, cello, harp, piano, percussion, and electronics, and “Transitions” for solo cello. The performers on the album are ICE members Kyle Armbrust on viola, Michael Nicolas on cello, Nuiko Wadden on harp, Cory Smythe on piano, and Nathan Davis on percussion. The title track is a tetralogy of works that together form a unified structure—the four main movements are connected by texturally fascinating transitions and framed by a prologue and epilogue. The first movement is an airy, delicate sound world aptly titled “Luminance.” The percussion and electronics provide a slowly rumbling bass part beneath a gradually shifting texture of sound materials, melodic fragments, and harmonies. The second movement, titled “Serenity,” is an entire ocean of sound: infinitely varied yet beautifully unified in its ever-changing timbres and textures. The translucent calm sparkles with gorgeous harp details and gentle piano echoes, the vast and limitless soundscape punctuated with delicate, misty whispers of simple melodies. The third movement is much shorter than the rest. Clocking in at less than four minutes, “Existence” is a slow and pensive journey, each bow stroke in the strings a deliberate, measured step through an atmospheric sound mass of deep drones and rumbling echoes. The piece ends with “Remembrance,” a movement which delicately balances the lyrical, long-breathed melodies of the strings with the harmonic depth of piano and the textural interest of percussion. In fact, the percussion part features an installation of metallic ornaments which Thorvaldsdottir designed specifically for use in this particular movement. The ornaments, called Klakabönd (which is Icelandic for “a bind of ice”), were created by artist Svana Jósepsdóttir. And if you’re lucky enough to see the piece performed live, there is an additional multimedia component: “In the Light of Air” incorporates a light constellation that was designed in collaboration with ICE. A collection of lightbulbs twinkles softly above the musicians during the performance, glowing and dimming according to the intensity of the music. The other piece on the album is “Transitions,” which was commissioned by cellist Michael Nicolas in 2014. The single movement work explores the theme of man and machine, both of which are represented through contrasting cello parts. Nicolas soars through the organic lyricism and expressive melodies of man while also excelling at the metallic timbres and technical accuracy of machine. Through his sensitive balance and imaginative interpretation of each role, he showcases the cello’s rich tone, wide pitch range, and stunning timbral depth. As a composer, Thorvaldsdottir is known for creating large sonic structures that reveal a vast variety of sustained sound materials—and both of these pieces are a perfect example of her visionary style. Throughout the album, her subtle timbral nuances, poetic textures, and lyrical gestures immerse the listener in austere, somber, and utterly spellbinding soundscapes. So in the end, Thorvaldsdottir is probably more of a sound sculptor than an ice sculptor—but either way, she is certainly carving out a name for herself in the contemporary music scene. In the Light of Air is released on August 28, 2015 – you can pre-order on Amazon or iTunes! This entry was posted in New Releases, On Demand Clips, Reviews and tagged 21st century music, anna thorvaldsdottir, christina jensen pr, claire chase, contemporary classical, cory smythe, digitice, existence, ICE, icelab, in the light of air, international contemporary ensemble, Klakabönd, kyle armbrust, luminance, michael nicolas, nathan davis, nuiko wadden, remembrance, serenity, sono luminus, Svana Jósepsdóttir, transitions by maestrobeats. Bookmark the permalink.